This is an all day tour, ideal for those wishing to learn more about the Falklands War and way of life. Upon leaving Stanley, we drive in a westerly direction south of the Wickham Heights mountain range, passing various sites that formed the battlegrounds of 1982. We will also see many of the remaining Argentinian minefields that are currently being slowly removed each summer by experienced clearance teams. Proceeding towards Darwin settlement we will call at the Argentinian Cemetery where many of their war dead are buried. As we continue on nearer to Darwin itself we will stop at the memorial of Colonel H Jones of the Parachute Regiment who was killed during the battle for Goose Green in May 1982. Here you will also be given a summary of the battle and shown the ‘gorse wall’ and the part it played in the battle. 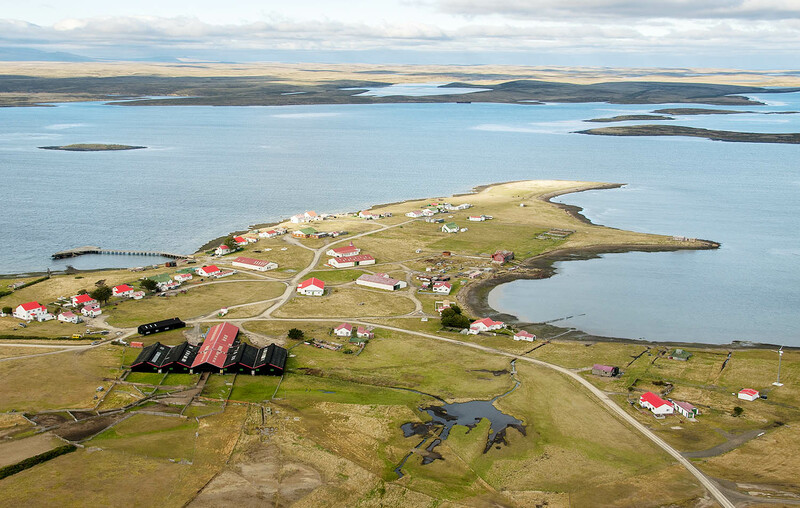 Darwin is a historic settlement with remnants of the gaucho days when wild cattle roamed the Falklands still visible. Having explored Darwin we will proceed to nearby Goose Green where a visit can be made to the Nick Taylor memorial site. Nick Taylor was a Harrier pilot shot down over Goose Green during the war. In Goose Green itself you can visit the infamous Community Hall where 115 people were imprisoned by the Argentine Forces for 29 days. A visit can also be made to the large Goose Green shearing shed where sheep shearing and wool handling can be explained. This shed also served as a prisoner of war camp after the liberation of Goose Green. Topping Sussex Mountain to the north the view of San Carlos Water is outstanding and takes in the sights of Ajax Bay, Wreck Farm, Head of the Bay Farm and San Carlos settlement itself. In San Carlos we find the peaceful British War Cemetery and in the bay a buoy can be seen marking the position that HMS Antelope sank. Ajax Bay is visible across the water and was the 1982 Field Hospital. Finishing with a visit to the small but excellent 1982 museum in the settlement we then head back to Stanley along the road that we took to San Carlos, or alternatively head over San Carlos Mountain and return to Stanley north of the Wickham Heights making this tour into a ‘round robin’. On this side of the mountain range we stop at Teal Inlet at the memorial to the members of the Parachute Regiment killed in the battle for Mount Longdon, before continuing on to our farm Estancia where 3 Para were based before the battles for Stanley. On the drive to Stanley we pass 2 destroyed Argentinian helicopters and get an excellent view of the mountains where the main battles took place during the last days of war. This tour also provides the opportunity to gain an insight into the Falklands way of life. As you pass through the farms in the summer months you may see shepherds at work moving large mobs of sheep, shearers skilfully removing fleece after fleece in the shearing sheds, and an opportunity to discuss our system of education for the children who grow up on these farms. The views from the mountain tops are fantastic and it is also possible to see wildlife such as Black Necked Swans, Variable Hawks and the abundant Upland and Ruddy Headed Geese, as well as many of the impressive Stone Runs.